Garden variety of Black nightshade - related to tomatoes, peppers, tobacco, eggplant and potato. Resembles a pepper plant, bushy and erect. Its leaves are pepper-like, pointed, and medium green. the size of a large blackcurrant - green when immature and black when mature. Can freeze it for later use. Use as a substitute for other berries in recipes. Can be cooked, sweetened and used on their own, or combined with other fruits such as apples, lemons and grapes, to make jellies, preserves, jams, chutneys and pies. Garden huckleberries make an excellent syrup. Is great on pancakes, waffles and ice cream. and to add about 1-1/4 cups of sugar for every four cups of raw berries. lemons and grapes, to make jellies, preserves, jams, chutneys and pies. Garden huckleberries make an excellent syrup. Is great on pancakes, waffles and ice cream. The fruits are not edible until fully ripe. They are toxic if eaten unripe. 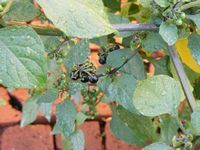 Berries are ready to harvest about two weeks after they first turn black, when their skin has changed from shiny to dull, and the flesh is very soft.